Pearl-Cohn High School was one of two Metro high school basketball teams making an appearance at the 2019 Tennessee Secondary School Athletic Association state championship playoffs. Senior Steven Watkins, who towers over his opponents at 6’2, was a huge part of taking his team to the next level. Stephen Goheen’s commitment to children began long before he started working at H.G. Hill Middle School as the front office secretary two years ago. As a foster parent for the Tennessee Department of Children’s Service, he decided to seek a career within the school district because it was more conducive to a “kid-friendly” schedule. Aalysa Cameron, a seventh grader at Margaret Allen Middle School, is a member of the Sports Club at her middle school. While participating in Sports Club, students have the opportunity to try-out and learn about various extra-curricular activities the school offers. After much consideration and some positive persuading from her coach, Cameron was drawn to track and field. “This is my first time participating in any sport at my school and I wanted to try something out of the norm for me. Track and field was it,” Cameron said. Social workers connect what happens in the home, what happens in the community and what happens in the school – and they strive to provide social and emotional support in a way that promotes students’ overall success, both in life and in school. They invest their time, training and expertise to remedy barriers to learning - wherever they may be in a student’s life. Throughout the month of March, we’re honoring the work these employees do in service to our students every day. School social workers’ responsibilities range from crisis intervention, to in-staff training programs, to identifying and reporting severe cases like child abuse and neglect. If it sounds like a big job, that’s because it is. Whether a student, parent, or faculty member, walking into the Eakin Elementary School front office guarantees one thing – being greeted with a smile and maybe a big hug. from the Administrator of School Financial Payroll Records, Diane Bain. That burst of friendliness comes from Nancy “Diane” Bain, a product of Metro Nashville Public Schools. She has been employed with the district for the past 31 years and currently serves as administrator of school financial payroll records at Eakin. After graduating from Cohn High School, she married her high school sweetheart and soon pursued a career as a certified nursing technician. But it wasn’t long before Bain had a change of heart relative to her career choice. Matthew Oberlander has been wrestling since he was a little boy, in first grade, he was already attending one-hour practices to enhance his skills and techniques. From starting so young, he quickly learned that wrestling was a good fit for him. Oberlander is now a successful middle school wrestler who has been named the first three- time middle school city-wrestling champion in Nashville. Have you ever wondered what a kindergarten classroom in MNPS looks like? Ahead of this year’s kindergarten registration, we’re opening the doors into these bright, creative spaces of teaching and learning so you can see what our youngest learners see. Charity McCracken is a kindergarten teacher at Haywood Elementary, where she has welcomed our youngest learners for three years. 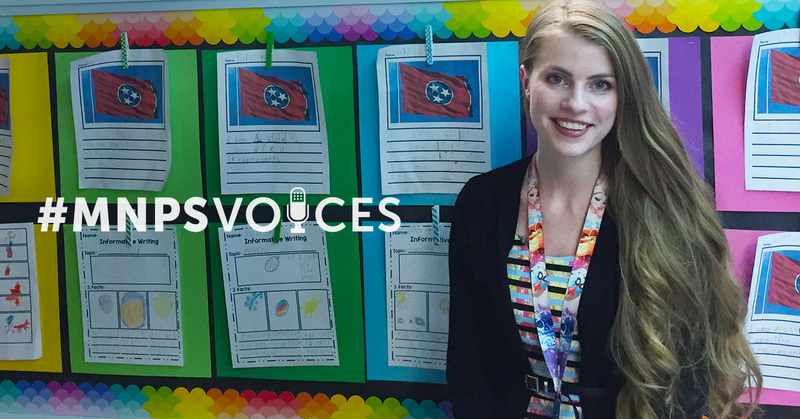 She has an elementary education degree from Vanderbilt University, an English as a second language (ESL) certification and is currently getting a masters in curriculum and instruction. Her room is colorful, creative and inclusive — inviting her students to be the same in their learning. Students found 131 pounds of food waste. Here's what they're doing about it. Have you ever studied what you’re throwing in the trash? You may not have, but kids around Metro Schools’ middle schools are doing just that – and for good reason. According to the Environmental Protection Agency, almost 95 percent of the food we throw away every day – from unwanted leftovers to spoiled produce – ends up in a landfill, where it isn’t exposed to oxygen and instead releases harmful methane gasses into the atmosphere. This wasted food, an estimated 63 million tons of food per year in the US, depletes precious resources like water and energy and harms wildlife habitat. Through an initiative with Urban Green Lab and World Wildlife Fund’s Food Waste Warriors program, some resourceful middle school students are seeking to change that burden on our landfills and find a more sustainable, environmentally friendly way to prevent and reduce that food waste. Considering one middle school counted just over 100 pounds of food waste after one single lunch day, our schools certainly have the opportunity to make a real impact.